Watching “The Looming Tower” is like watching a catastrophe unfold in tortoise-like slo-mo, from some first vague quavers to the collapse of our country’s foundation. The 10-episode limited series takes a scripted look back at the deep rifts between the CIA and the FBI leading up to the events of Sept. 11, 2001, exploring how that ego-driven antagonism undermined the possibility of prevention. It’s like watching Tom and Jerry play a testosterone-fueled game of cat and mouse while a venomous snake quietly slithers past them in a suicide vest. You keep thinking the men — in particular Jeff Daniels’s FBI special agent John O’Neill and Peter Sarsgaard’s CIA analyst Martin Schmidt — will check themselves in time, find a way to collaborate, and share intelligence without bruising their professional vanity. You keep hoping that the inevitable isn’t, that they’ll stop Osama bin Laden as he gains global sway with the 1998 Kenyan embassy and 2000 USS Cole bombings. You keep envisioning a happy movie ending, with Al Qaeda in chains, the wars in Iraq and Afghanistan merely disasters averted, and a few US heroes honored. But of course the limited series, which premieres Wednesday on Hulu, heads unstoppably into the worst case. 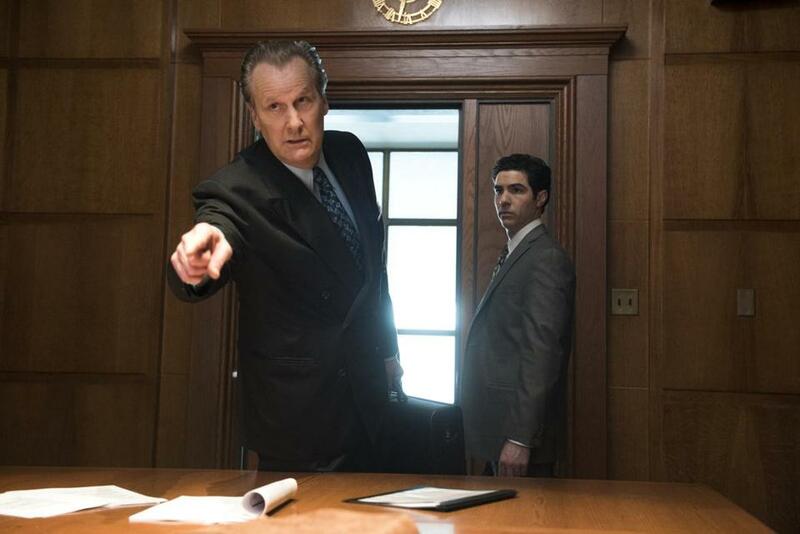 There are no heroes in “The Looming Tower,” at least in the first three episodes available for review, just smart but flawed individuals like O’Neill and Schmidt up against the terrorists, the complacency of their agencies regarding jihad, and, perhaps most of all, their own pigheadedness. If you’re expecting “The Looming Tower” to celebrate those who fought bin Laden, however unsuccessfully, you will be disappointed. Based on the Pulitzer Prize-winning nonfiction book “The Looming Tower: Al Qaeda and the Road to 9/11” by Lawrence Wright, it does not go easy when it comes to assigning blame. It’s a testament to “The Looming Tower” that the story is as gripping as it is, given that we know where it’s all going. Co-created by Dan Futterman and Alex Gibney, it plays a bit like “Homeland” before “Homeland” got played out, as the agents fly in and out of the Middle East, encountering tension-and-release close calls and dealing with their personal demons. In Daniels’s hands, O’Neill is full of himself, a tacky womanizer who uses the same lines on each of his lovers. And Sarsgaard’s Schmidt is prickly and smug. In a meeting with counterterrorism honcho Richard Clarke, played by Michael Stuhlbarg, the two men are like an embittered and bickering couple in therapy. None of the players knows just how awful the inevitable attack on American soil will be, a truth that makes them a little less dislikable along the way. But the only truly sympathetic guy in “The Looming Tower” is Ali Soufan, one of only eight FBI agents able to speak Arabic. Working with O’Neill, Soufan is played by Tahar Rahim as a gentle, skilled Muslim agent who isn’t part of the power struggle that afflicts the careerists around him. Rahim’s mild manner is welcome in this mano-a-mano atmosphere, and I’d love to see him get more leading-man work. Do we need a somewhat feeble subplot about Soufan’s efforts to court a woman named Heather (Ella Rae Peck), efforts foiled thanks to the distractions of his job? Probably not. Likewise O’Neill’s affairs, which aren’t developed beyond cliché early on. Fortunately, the half-baked romances don’t trip up the series’ steady pace. As if to remind us of innocence lost, as well as of the naivete of the CIA and FBI agents before 9/11, “The Looming Tower,” which opens in 1998, features a few scenes in which a background TV is airing news about Monica Lewinsky. Our country is captivated and divided by the case, unaware that a nascent but far greater danger is heading our way. We’re fighting over that blue dress, all while that snake quietly sneaks by. Starring: Jeff Daniels, Peter Sarsgaard, Tahar Rahim, Annie Parisse, Wrenn Schmidt, Michael Stuhlbarg, Bill Camp, Sullivan Jones, Virginia Kull, Louis Cancelmi. On: Hulu, premiering Feb. 28.